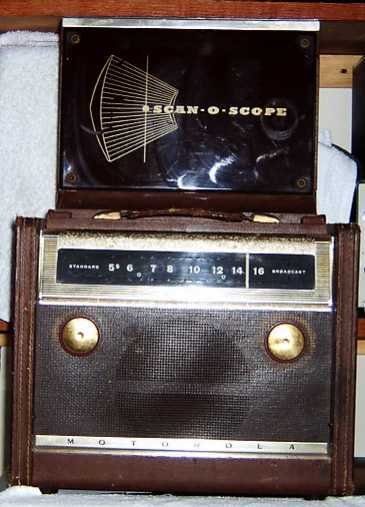 With it's featured 'Scan-O-Scope' antenna and leatherette covering, this is a solid, wooden cased set. It has a fairly standard 'AA5' type tube lineup with miniature tubes in the series string arrangement that US practice seems to have preferred. Service and production information is scarce, but as the makers label reads 'Motorola', and not 'Galvin Manufacturing', we may safely assume that this set is post-1947, when the company name was changed. Additionally, it features the triangular 'CD' markers on the dial face at 640KHz and 1240KHz, which dates it to later than 1953 (when it became compulsory for these markers to be added). This is a smart looking set that gives a good tone. It was also available in black as the model 65L1.